Spring’s arrival. Time to awaken from winter’s hibernation, leave the darkened cave, and embrace Nature in all her forms. Our muscles, weakened from disuse, need exercise . . . but let’s ease into it. To prepare yourself for a full-throttle summer, consider taking short day trips to stretch your legs and clear the mental cobwebs. Begin with tiny steps. 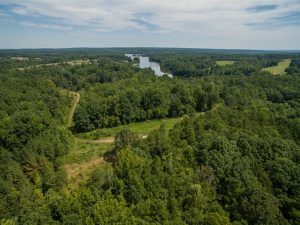 Perhaps an outing to Angler’s Park (350 Northside Dr., Danville), a 44-acre park that features hiking, mountain biking, fishing, picnicking, and trail running. 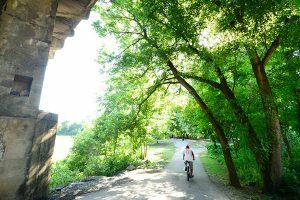 Its popular River Walk Trail runs along the Dan River. Or cast off at Farmer Lake (3268 Badgett Sisters Pkwy, Yanceyville, NC, 336.694.5522), a quiet 365 acre lake (no jet skis or swimming), ideal for fishing. Rent a 1-seat canoe/kayak all day for $15 or a 2-seater for $20. At the public dock, you will find a covered picnic shelter with 8 tables, grills, electricity, and water. Having lived on the lake for over 20 years, I can attest that it’s a great place for catching bass, crappie, catfish, and bream. Perhaps, rather than gently paddling on the lake, you prefer a little white water on the Dan. The Dan River Company (danrivercompany.com), about 60 miles west in Danbury NC, rents kayaks/canoes and offers a shuttle service. 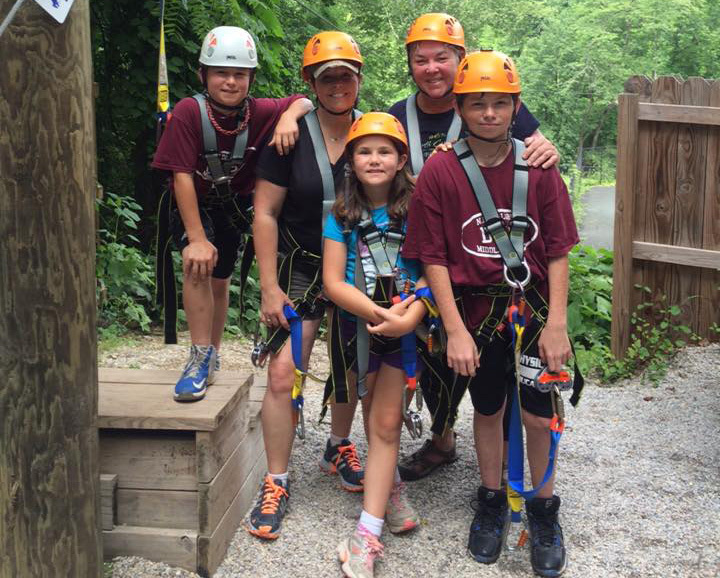 If you can’t make it to Nantahala, there are zip-line opportunities closer to home. Danville Parks and Recreation occasionally offers rides down a 400-foot zip-line. Call first, though (434.799.5150). I took the grandchildren for one event, but the staff never materialized. Perhaps you are looking for more rugged terrain. Pilot Mountain (336.325.2366), its flat mountain similar to that from Close Encounters of the Third Kind, and Hanging Rock State Park, which includes mountain bike trails and rock climbing, are less than 2 hours away. During my graduate school years, I camped out on Pilot Mountain. During the day, my friend Anis and I hiked the trails; in the evening, we cooked burgers on the grill and listened to “Ranger Rick’s” evening talk. One can only eat so much trail mix. 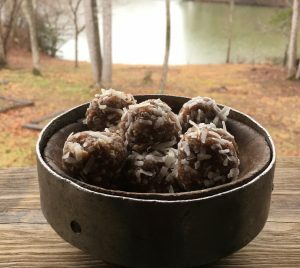 Therefore, let me suggest some “snacks” to drop into your back- or fanny-pack before setting out on spring adventures. In food processor, process walnuts and coconut until crumbly. Add dates, coconut oil, vanilla, salt, and orange zest. Process again until you have a sticky batter. Take a heaping tablespoon of dough and roll between your palms to create balls. Roll in some extra coconut. Place on parchment-lined sheet, then in freezer for an hour. Store in a sealed container in the fridge for up to a week. I wonder what a frozen one would taste like? Yum. Note: If you want a sweeter ball, add a few tablespoons of powdered sugar to the mix before you process. I am almost embarrassed to mention this one, but it is cute and easy. In the bottom of a small canning jar, spoon in some peanut or almond or cashew butter. Julienne-cut celery stalks in lengths so that they will fit comfortably in the jar. 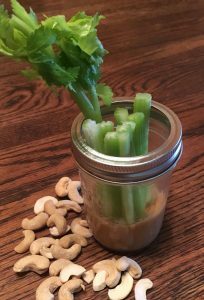 Poke the celery stalks into the nut butter. Screw on the lid. Voila! An all-natural food leather made from ripe pears touched with cinnamon. For this recipe, you need a silpat. Begin by preheating the oven to 170°. Place a silicone baking mat in the middle of a rimmed baking sheet. Peel 1 ½ lbs. of pears, cut in half and remove stems and cores. Cut into large dice and place in a saucepan. Add 1/4 C water, 2 TB honey, 1/4 tsp. ground cinnamon, and a pinch of salt. Pour mixture into a blender and add 2 TB lemon juice. Remove the small cap from the blender lid (the pour lid) and cover with a kitchen towel (this lets the steam escape and avoids explosions); blend on high speed until you’ve got a very smooth purée, about 1 minute. Use a rubber spatula to spread the mixture over any empty spots. Grab the sides of the sheet pan and with fingers holding the mat in place, gently shake to even out the surface of the puree. Place on the middle rack in the oven. Bake for 6-7 hours or until it feels a little sitck but your finger doesn’t’ leave an indentation. Remove from oven and cool completely. On your workplace, lay a 16-inch long sheet of parchment or waxed paper. Starting ath the short edge, remove the fruit leather and transfer it to the paper. Use kitchen shears to cut through the leather and parchment to create strips. Then roll up, paper and all (to prevent sticking). In should keep in an airtight container for a week or so. 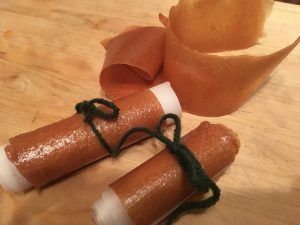 Strawberry Leather: To make strawberry leather, use 1 1/2 lbs. strawberries, 1/3 C sugar, pinch of salt, and 2 TB. lemon juice. First blend in the blender, then pour through a fine-meshed sieve (to remove the seeds) into the saucepan. Cook over medium until it bubbles, then reduce to medium-low and simmer until it begins to get thick and syrupy (about 15-20 minutes). Lucindy Willis, Ph.D. retired from NCSU to open the Yancey House Restaurant (2005-2011). She now teacher culinary classes at your cabin on Farmer Lake. For more information about classes or to sign up for the newsletter, visit terrapincovefarm.com.